Roots run deep... And my roots look like lightening bolts! I love it when someone wants this design, because I play Grateful Dead music and have such wonderful memories while making their shoes. 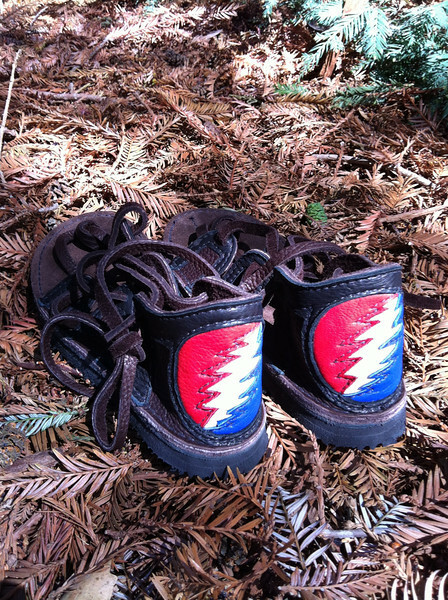 This pair is for a special Deadhead up on the California north coast. She designed a chocolate four tab sandal, with black deerskin trim, and the 13 point lightening bolt - of the Steal Your Face heritage - in red, white, and blue deerskin. The soling is thin cushi, Spikeless Golf Vibram soling, and Megan's special messages written in between. These shoes are made for dancing!